THIS WEEK'S RANDOM QUESTION: Why did you become a reader? Happy February! I hope you're looking forward to it. This was a rough weekend for me--nothing seemed to go right. I'm praying today is better. I was sad to miss The Friday 56 last week. Had to do with the "nothing going right" weekend. Did you get a chance to read my review of To the Moon and Back by Kathi Macias? Fabulous book! It reminded me of how much I miss her books. I used to read each new one that came out, but that ended with the release of The Moses Quilt. After reviewing The Mayflower Bride by Kimberley Woodhouse, I asked the publisher to keep me in mind for the next two books. 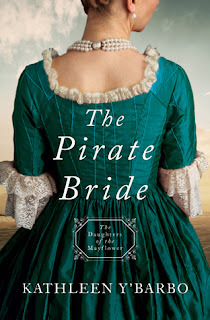 The Pirate Bride by Kathleen Y'Barbo arrived last week. Love the cover. One hundred years after her mother's family came to the New World on the Mayflower, Maribel Cordova has landed in New Orleans to seek the man who holds the key to finding her father’s lost treasure. Attorney Jean-Luc Valmot has buried his past life so deep that no living person will ever find it—or so he hopes as he accepts a position on the governor’s staff. But the daughter of an infamous pirate threatens all he holds dear. Can Maribel and Jean-Luc compromise so they both can hold onto what they most desire? I hope to start reading it on school vacation week. Not sure what else I'll read, but I would like to polish off three books. How about you? School vacation coming up? Planning on doing some reading? As for this week's question, it seemed natural for me to become a reader. Both my parents enjoyed reading and we didn't exactly have a ton of things to do growing up. Most of my days were spent outside after school, but I had a lot of free time to spend reading. Both my sisters grew up to be readers as well. How about you? How did you become a reader? Think that is all from me this week. Hope you have a great one.